Jonah Hex is back! 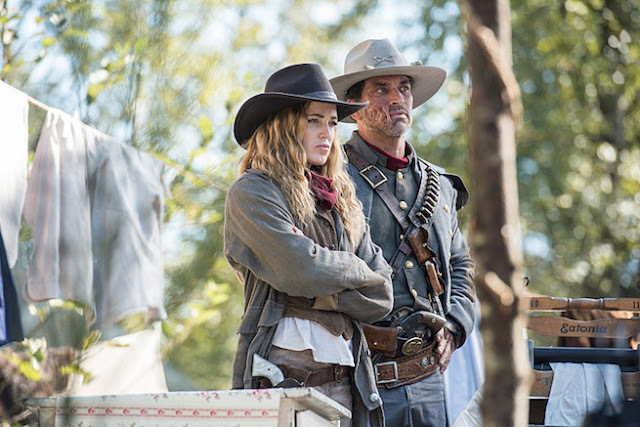 The notorious gunslinger with the scarred face from DC Comics will be seen again on the next episode of 'DC's Legends of Tomorrow." The only time you'll see an unattractive Johnathon Schaech, his Hex is at odds with his old rival Quentin Turnbull (Jeff Fahey) when the Legends land back in the Old West. They also get a clue that a speedster is leading the Legion of Doom. DC's Legends of Tomorrow airs at 8 p.m. on The CW. "Outlaw Country" airs on November 17, 2016. The Legends are still reeling from the news that their time travel-nemesis is a speedster when they are alerted to an Aberration in the Old West. When the Legends arrive they find their old friend Jonah Hex (guest star Jonathan Schaech) in trouble with his arch-nemesis, Quentin Turnbull (guest star Jeff Fahey). The team soon discovers that they need to stop Turnbull and his gang from conquering the West and branding it his own lawless territory. To Hex’s surprise, Sara (Caity Lotz) is in charge and dispatches the team. Rory (Dominic Purcell) is ecstatic to be in the Wild West, but Sara makes Amaya (Maisie Richardson-Sellers) work with him to keep him on task, which is easier said than done. Meanwhile, Nate (Nick Zano), Ray (Brandon Routh) and Jax (Franz Drameh) try to infiltrate Turnball’s gang, but find themselves in a shootout leaving Nate’s confidence shaken. Victor Garber also stars. Cherie Nowlan directed the episode written by Matthew Maala & Chris Fedak.